Dhaka Dynamites won the BPL 2016 final against Rajshahi Kings by 56 runs. As Dhaka franchises they won third time BPL Title as well. After change the franchise owner and name Dhaka as Dhaka Dynamites got the title of BPL 2016. Sangakara is the man of the final match and Mahamudulla is the man of the tournament so far. Also Tamim Iqbal is the most valuable local player. Here you have to see here BPL 2016 final match highlights and full scorecard. In the BPL T20 2016 final match, Rajshahi Kings won the toss and Sammy elected to field first. Dhaka Dynamites given 160 runs target. But in replay Rajshahi Kings did not well. Mominul Houqeq, Samit Patle and Sabbir Rahman only score two digit figure. Captain D Summay hitted 1 six from 2 balls and bowled by Shakib. So It was not very excited match at all. The BPL final match was al most one sided. 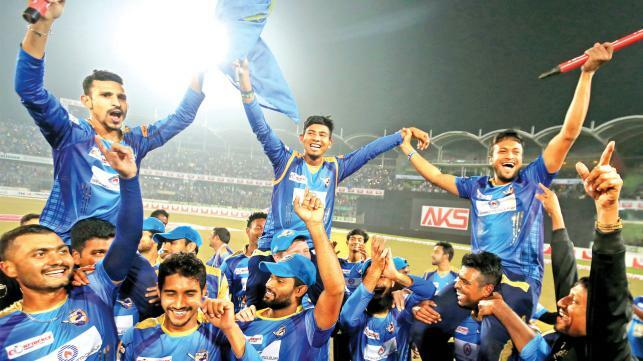 By the final Dhaka Dynamites won maiden Champion. Who is the man of the match in BPL Final? Who is the man of the tournament? Who is the most valuable local player so far? You will get the answer that Kumar Sangakara is the man of the match of Dhaka Dynamites. Khulna Titans captain Mahamudullah is the man of the tournament. And Tamim Iqbal of Chittagong Vikings is the most local valuable player in this BPL T20 2016 tournament session 4. Mashrafe Bin Mortaza led the Gladiators and the Victorians to the title in all three previous tournaments. Shakib has now notched his first title win as captain. Rajshahi openers were watchful at the start of their chase but the stand was broken when pacer Abu Jayed took out Nurul Hasan (5) in the third over with a slower. Sabbir Rahman (26) and Mominul Haque (27) then patiently played themselves in and added 47 for the second wicket. Dhaka Dynamites: 159/9 in 20 over (Maruf 8, Lewis 45, Nasir 5, Mosaddek 5, Sangakkara 36, Bravo 13, Russell 8, Shakib 12, Alauddin 1, Sunzamul 12*, Abu Jayed 0*; Williams 1/36, Farhad 3/28, Miraz 1/22, Afif 1/23, Sammy 1/22, Nazmul 0/13, Patel 1/8). Rajshahi Kings: 103 in 17.4 overs (Nurul 8, Mominul 27, Sabbir 26, Patel 17, Franklin 5, Sammy 6, Afif 4*, Miraz 1, Farhad 2, Williams 3 (ret. hurt), Nazmnul 1; Abu Jayed 2/12, Russell 1/21, Shakib 2/30, Brvo 1/20, Sunzamul 2/17). Result: Dhaka Dynamites win by 56 runs.